Big-screen, premium tech and low price. What's not to like? Apple has made IPS screen technology almost obligatory, so is there any point in the new BenQ GW2750HM monitor and its VA panel? VA technology is certainly an intriguing alternative and offers advantages over both IPS and cheap 'n' cheerful TN screens. What's more, the BenQ's 27-inch diagonal puts it in a tricky market that hasn't yet been assimilated by the more affordable IPS screens. Currently, you're either looking at £500-plus IPS panels, such as the Dell U2711 or the Samsung S27A850D, which both use closely related PLS panel tech, or any of a number of bargain basement 27-inchers with TN screens. There are also a few similar VA 27-inch monitors already available, such as the Philips Brilliance 273P3QPYES. But even then they are still £300 or thereabouts. That leaves plenty of space for the sub-£200 BenQ to carve out a niche as an affordable 27-inch option with a premium panel. 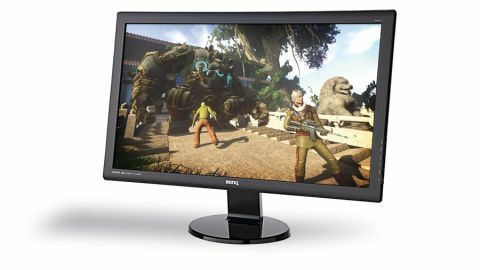 We've established this 'ere BenQ monitor is unusual in the 27-inch market by virtue of its VA panel and modest price. What else is there to know? For starters, it's 1,920 x 1,080 pixels and not the 2,560 x 1,400 grid offered by 27-inchers sold for around £500. Inputs wise, you get VGA, DVI and HDMI, and therefore all your non-DisplayPort bases are basically covered. BenQ has also thrown in the usual image quality processing options, including dynamic contrast and three levels of pixel response. Oh, and if you're wondering about the backlight, it's LED. What you don't get is a luxurious chassis or a fully adjustable stand. Anonymous black plastic and some tilting action is your lot. But what about the image quality? At first glance, you might wonder what all the fuss is about. The colours are relatively subdued and the LED backlight isn't exactly turbo charged. Likewise, the image quality enhancements are no more use on the BenQ than they are on any other monitor. The dynamic contrast is clunky and the highest response setting introduces some fairly harsh inverse ghosting. Put it down a notch and the response is noticeably worse than your average TN panel. Spend a little more time with the monitor, however, and you'll begin to appreciate the depth of the blacks this panel is able to generate. We're not entirely convinced the 5,000 to one claim is kosher though. But no TN panel we've seen produces blacks like this. Props to BenQ then for putting this panel together properly. The result is even backlighting and no edge bleed. If you're paying a little more for a premium panel, you might expect more immediate visual impact than the BenQ is able to deliver. It's a low-key monitor in terms of image quality, the build's not great either and the tilt-only stand is a bit low rent. But a sub-£200 price is very welcome for a 27-inch screen with a premium panel. It also has both DVI and HDMI inputs. The BenQ is a cut above the TN hordes when it comes to contrast and viewing angles and a nice alternative, though not necessarily a must-buy.